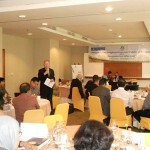 A gathering of judges from Indonesia’s top courts, as well as leading government officials, met in Jakarta on 8 March 2012 to attend a workshop on exceptions to the right to information. The seminar, organised by Supreme Court, CLD and the Indonesian Center for Environmental Law (ICEL), was held at the invitation of the Supreme Court. One of Australia’s foremost jurists, the Honourable Michael Kirby AC CMG, delivered the keynote presentation. Among those in attendance were Sultony Mohdally, Supreme Court Judge, Regional Attorney General Suhendra, senior representatives from the Indonesian National Police Headquarters, and several judges and Information Commission representatives, who travelled from around Indonesia to attend the workshop. 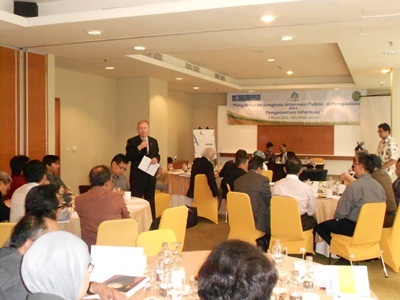 The judicial conference was held as part of CLD’s ongoing work in Indonesia, which includes training civil society representatives and journalists on how to use the right to information law, advocacy to galvanise opposition to overbroad secrecy rules and publications focusing on exceptions, training, implementation of the law by pbulic bodies and problems with the draft secrecy law.